Muscovy ducklings grouping to leave nest"
"2-month-old Muscovy ducklings sound asleep"
I personally have enjoyed watching the moscovy ducks in the nearby lake. 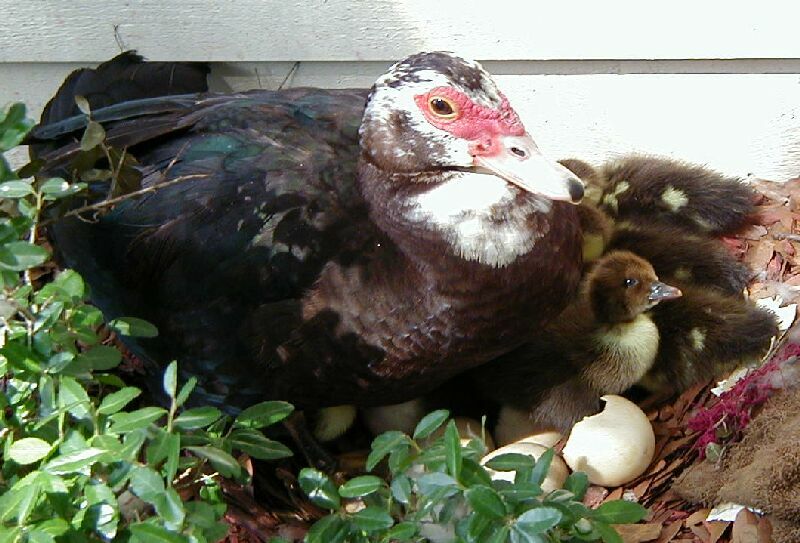 The male ducks are huge, the females are much smaller. 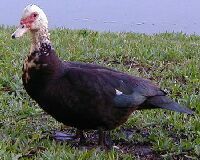 I find it very interesting that these type of ducks don't "quack" as do the other ducks in the lake...the males make a huffing or whisper sound, the hens make a very quiet odd sound. They enjoy being fed, and particularly like to "catch" bread in their beak more than putting bread pieces on the grass. 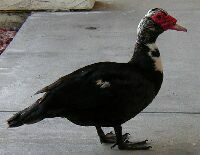 At present, there is a group of four muscovy ducks at the lake...two males and two females. 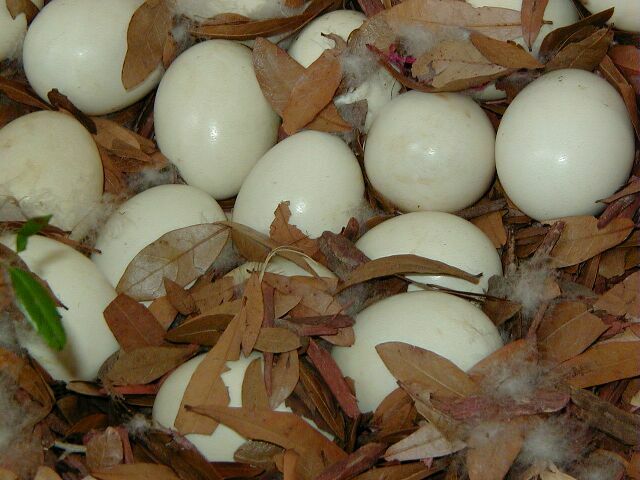 February 10, 2003 The 17 eggs of the hen I named "Midnight", hatched on February 10, 2003. It was a cold day, even for Florida...in the 40's. 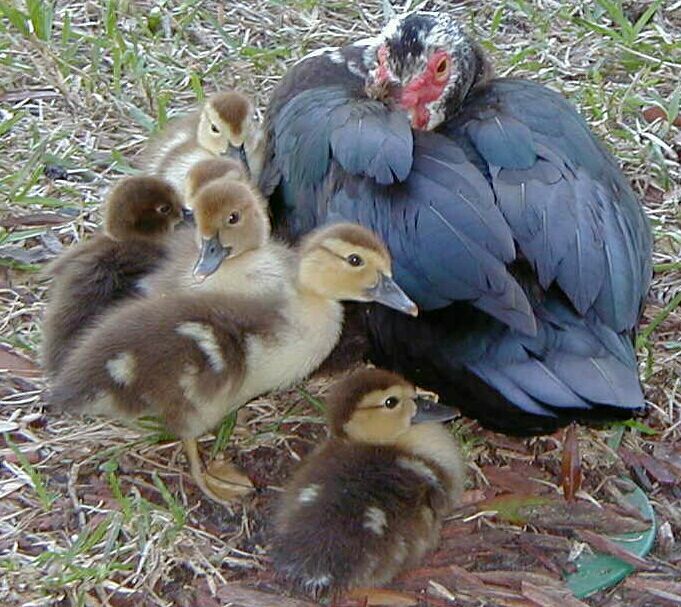 "Midnight" proudly walked her ducklings to the pond where she introduced them to the lake. 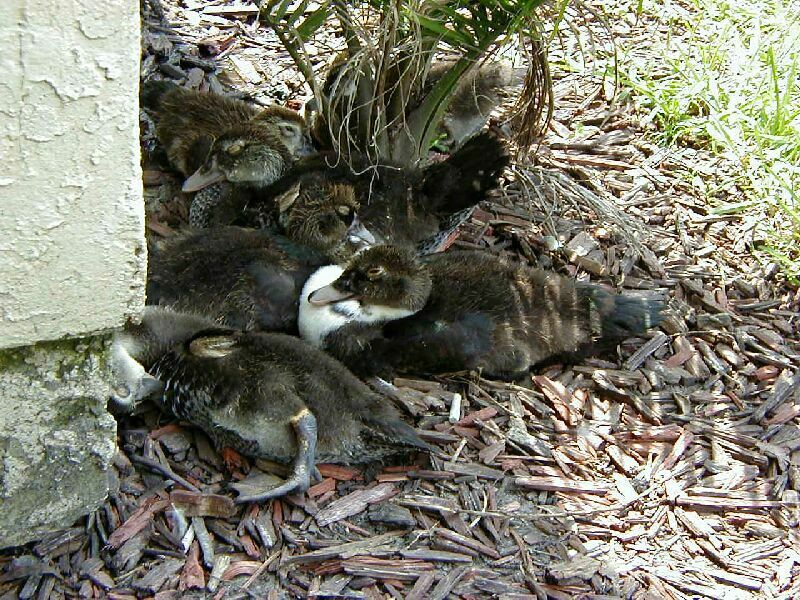 Seventeen ducklings was a lot to protect, and the predators and weather took its toll. 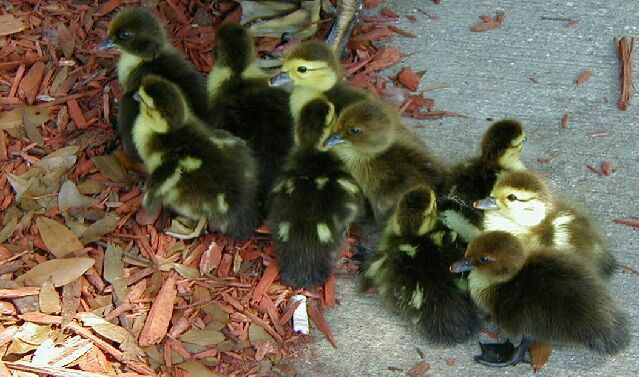 One by one, there would be less ducklings "daily", and after four weeks, only one duckling remained...so I called him "Omega" meaning "last one". 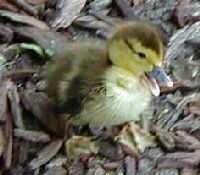 It has been a wonderful experience watching "Omega" grow up from that tiny duckling to being larger than his father now. He has such a nice disposition, and stops by to visit me every now and then. 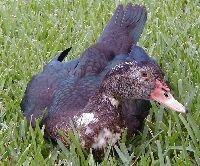 He's a beautiful full grown bird now, and can fly...it's been great to watch him grown from "duckling" to "adult" drake. May 12, 2003The photos above are of "Midnight's" nest. It consisted of a lot of leaves, down, an old washcloth from someones laundry, and a gardening work glove. She nested next to the laundry building in my apartment area. It seemed like an odd place to nest, as it is such a busy area...I would have thought she would have nested in a more secluded area. 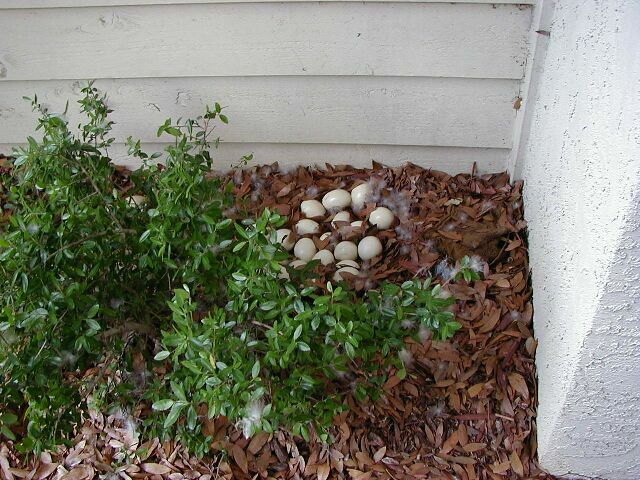 Everyone seemed to have left her alone, and after a month of nesting hatched 10 ducklings out of sixteen eggs total. 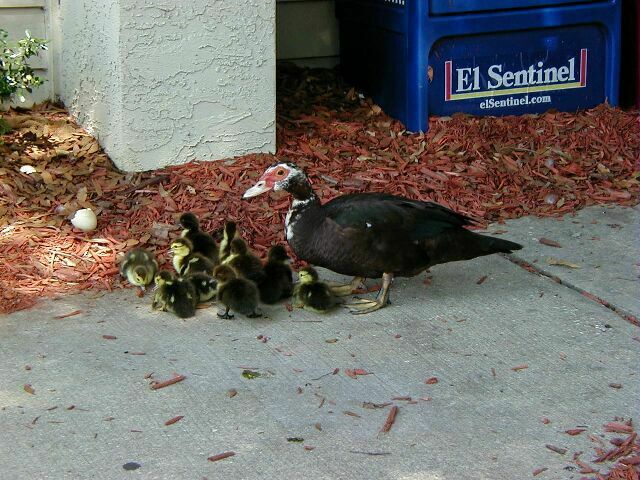 She left 6 eggs in her nest, unhatched, when she decided it was time to leave with the new ducklings and go to the lake. 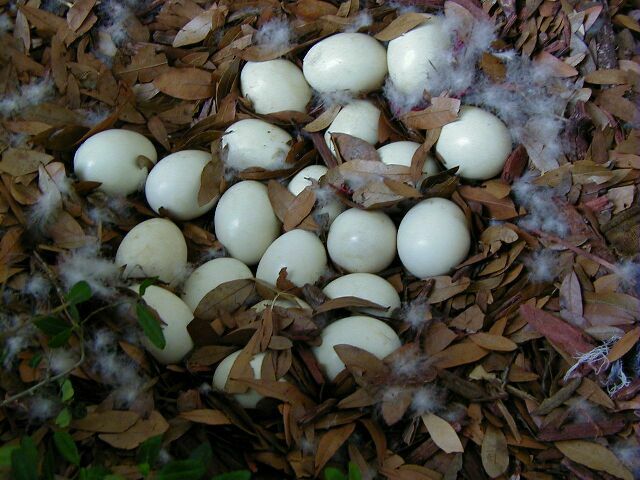 It's amazing that the hen knows whether or not they will hatch...which they didn't. 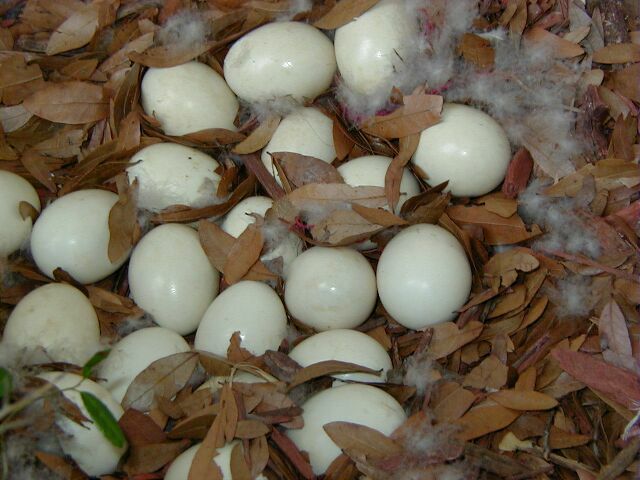 Out of the 10 hatched, only eight remain as of June 23, 2003. 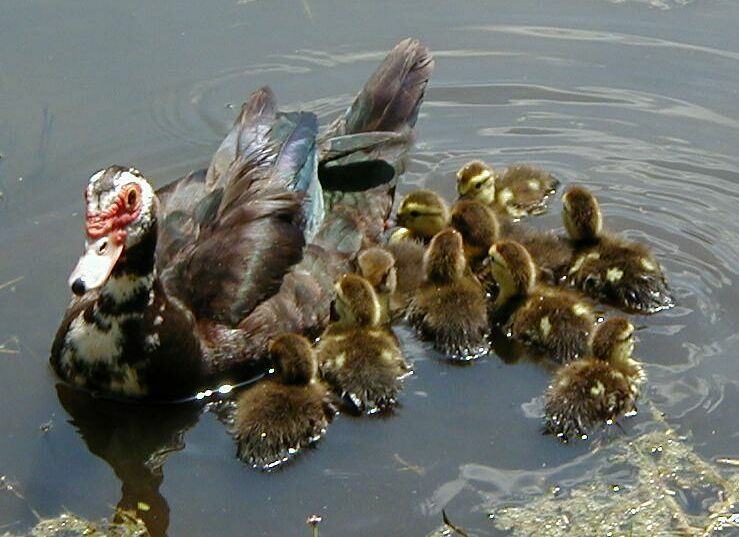 I think that having warm weather, and a drake Mallard who lost his mate...who helped to care for the ducklings...has played a huge role in the success of these ducklings having lived so long. 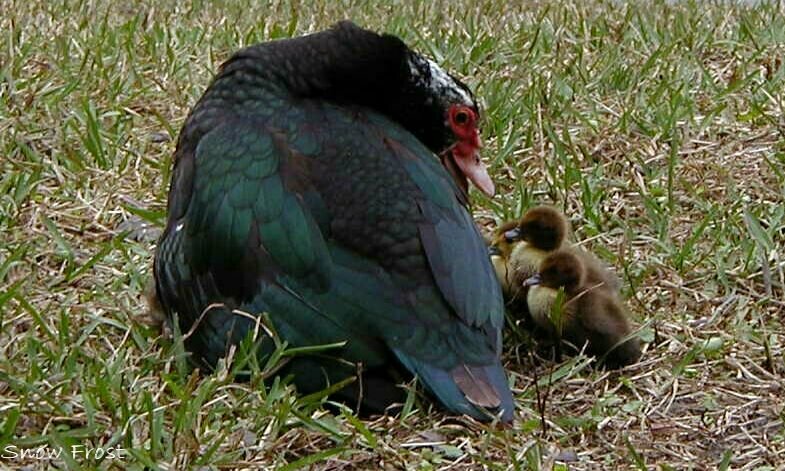 Midnight is a good mother, and has taught her ducklings all they need to know to survive...it's all now up to them growing their wings and flying away...and dodging those predators from now until then.